The Samsung Galaxy Tab comes with a 7-inch, 1024 x 600 pixels capacitive touchscreen, and supports playback a wide variety of multimedia file types, including MP3 and AAC music files plus DivX, XviD, MPEG4, H.263, and H.264 video files. All that and more make it a perfect device to watch videos and movies on the go. The following guide shows how to realize Galaxy tab file transfer by using Pavtube galaxy tab video converter, so as to put and play movies on Samsung Galaxy Tab smoothly. Galaxy tab file transfer-how to put and play movies on Galaxy Tab? 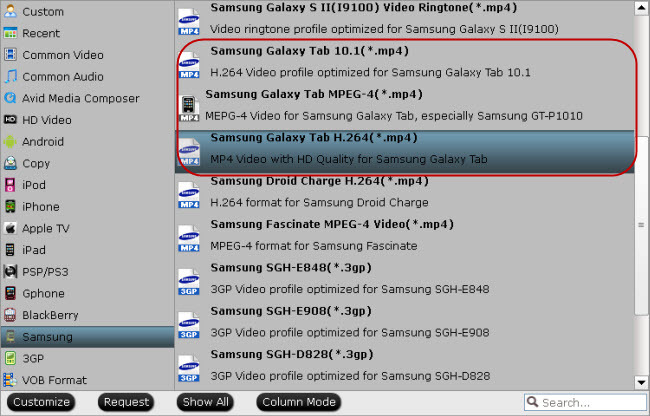 Once run the program, click “Add” button to load the video files that you wanna transfer to your Galaxy Tab. 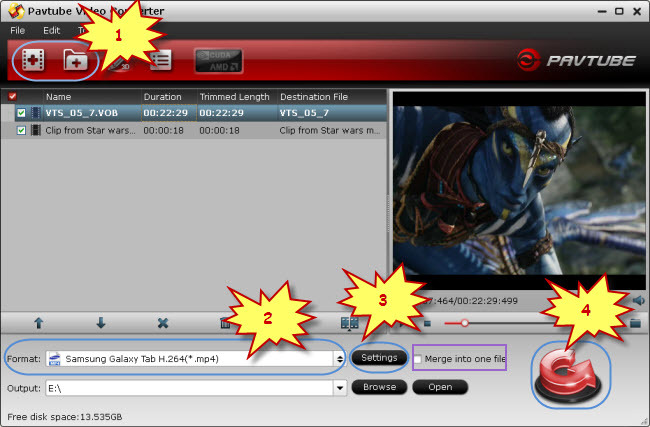 The galaxy tab video converter supports batch conversion, so you can add multiple files into it to convert at a time. Meanwhile, if you wanna combine several files into a single file, you can put a checkmark in the checkbox “Merge into one file” to achieve the goal. To transfer movies to galaxy tab, you need select Galaxy Tab supported video formats as output format, like DivX, XviD, MPEG4, H.263, and H.264. Pavtube Video to Galaxy Tab Converter offers opyimized presets for Galaxy Tab. Just click on the dropdown list of “Format” to choose one from "Samsung" option. Pavtube galaxy tab video converter allows users clicking “Settings” button to adjust audio and video parameters, so as to customize the final output file quality. The adjustable options include codec name, aspect ratio, bit rate, frame rate, sample rate and audio channel. Click “Convert” button to do Galaxy tab file transfer. With multi-thread encoding technology and optimized audio and video sync technology, Pavtube galaxy tab video converter can finish conversion at speed, and will never let you encounter troubles caused by audio and video out of sync issues. In addition, it adopts unique built-in codec, which can absolutely ensure not to install any codec on your computers to disturb the original systems. When the conversion is done, click “Open” button to get the output Galaxy Tab video. Then just connect Samsung Galaxy Tab to your PC via the USB cable, and now you are able to Put and Play Movies on Samsung Galaxy Tab. Pavtube Studio unveiled a column called iPad Video Specials to help beginners enjoy movies and TV shows on iPad, iPad 2 and the new iPad 3. This column explains how to use iPad to watch movies online, how to transfer local movies to iPad for watching, how to encode MKV/AVI/WMV to iPad compatible video, how to turn DVD and Blu-ray into iPad movies, as well as how to access iPad Video Mirroring and Streaming.